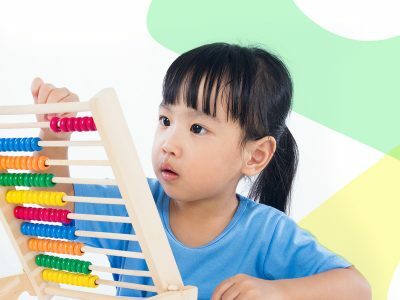 The Big Idea: You’re already doing math all the time in everyday life—show kids how much fun it can be! Have a little fun with math and share the enjoyment of learning with kids during everyday moments. Try these math tips. If one works well, turn it into a daily routine! Kids will pick up on your “math confidence” and know that they can do it, too—anytime, anywhere. Discover numbers. Use your fingers to find out different ways to make eight. Start with five and three fingers. What else works? Measure with household objects. For example, how many straws do you think it will take to measure your hand? Explore parts of a whole. Ask kids to name the different parts of favorite toys or even the different parts of the face. Draw lines on the sidewalk. Have kids draw straight, angled, curved, zigzag, or looped lines with chalk on the sidewalk or driveway. Ask kids to complete a task (such as sitting quietly) by the time you reach 10. Count higher if kids need more time, and encourage them to count along!